There used to be many of you following this blog. Now I’m unsure if anyone will read this. In 2012 a few things happened in my life that caused me to withdraw from blogging. One of the factors was my separation from my then wife, Evette. This was extremely difficult for me due to the highly co-dependent nature of that relationship. It took me several years to really process that break up, to learn all the lessons I needed to learn, and then to be ready for a healthy relationship and ultimately for the new RPT. It’s difficult to cram five years into a paragraph. Enough to say I have a wonderful wife, Anastasia, an awesome five year old step-son and a gorgeous six months old baby. Life is good. I have spent the last five years in Russia, learning from great masters there. As I slowly healed myself I learned what was missing from Reference Point Therapy. And as I healed I developed a new and complete technique. I have been teaching this new method in Russia for the last two years. I’ve waited before announcing it here because I want everything to be “right.” I don’t want or need to rush this. This will be a perfect technique, launched perfectly. Within the next two months I will have a new website and will be introducing you to Rapid Personal Transformation - the world’s fastest and most effective method for creating permanent change. Fasten your seat-belts, it’s going to be an awesome ride. For the last month, over several articles, I’ve been exploring the relationship between trauma and psychic abilities. I’ve been arguing strongly that trauma is the cause of hearing voices (angels, guides, etc) or indeed believing that the source of spirituality is outside of yourself. Today we will expand on this discussion, including an important look at what happens on psychic development courses. The image by the way is my attempt at humor. For many years I taught psychic-stuff in Theta and was told by various people (including my father-in-law) that I was doing the devil’s work. In fact Evette still gets this from her dad. So let me play with it and let my friend in red signify what I’m talking about, the dangers of my former pastime. Do you need to be traumatized to be psychic? Is there an alternative to being psychic (in the traditional sense of the word) which is safer and healthier? In my previous article (read it before today’s article), I wrote about how scientific research linked certain psychic abilities with a type of brain damage called synesthesia. This was amazing research for two very different reasons. Quite amazingly, it looks like a limited scientific acceptance for some “psychic abilities” (mainly aura reading). I never thought I’d live to see that happen! But more importantly for my research, it validates my own theories about the links between psychic abilities and trauma. why people are healthy (free from trauma) and spiritually motivated complain that they lack intuition (they think there’s something wrong with them that they cannot “see” or “hear” psychically). In this Part 2 (of 3), I want to share my own personal thoughts and experiences on the relationship between psychic abilities and trauma, and to get your feedback/experience. A recent scientific study has given scientific credibility for the first time to the notion that healers have psychic abilities. This includes the ability to see auras (clairvoyance) and the ability to feel the another person’s feelings (clairsentience). This really is revolutionary and will change what some skeptics think about healers. But this news comes at a terrible cost. You see, psychic abilities have been shown to be a form of synesthesia. Syne-what you say? Synesthesia is a fascinating neurological condition. People with synesthesia (called synesthetes) have a cross-wiring in their brain. This might enable them for instance to “see” sounds or smells, to “hear” colors and to “feel” other people’s feelings. People with synesthesia see the world in a different way. Often they go insane. But with time and treatment they learn to use their gift to see the world differently. Many of the world’s greatest artists have been synesthetes. These includes painters David Hockney and Wassily Kandinsky, musicians like Billy Joel, and great inventors such as Nikola Tesla. Many people attribute “paranormal powers” to El Santón, such as his ability to see the aura of people “but, in fact, it is a clear case of synesthesia”, the researchers explain. 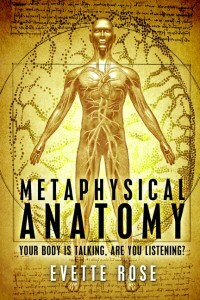 Metaphysical Anatomy represents the connection between mind and body. Based on the principle of “as above so below, as within so without,” you can connect the dots between the health of your body and the health of your environment. Our relationships and past experiences influence our body, not in a vague or “spiritual” way, but in a concrete and deterministic way. With the skills shared in this book, you can read a body like a book. Although many books have tried to do this, Metaphysical Anatomy is very different. Evette not only explains the significance and cause of a condition, but also instructions and guidelines for how to improve your quality of life by pointing out what blocks to work on. After cross-referencing many excellent texts and adding her own experience as a therapist, Evette has created a definitive guide. This book is written for the benefit of therapists seeking guidance to improve their clients’ quality of life. It is also easily accessible by the general public in search of answers for their own health, emotional and mental wellbeing. 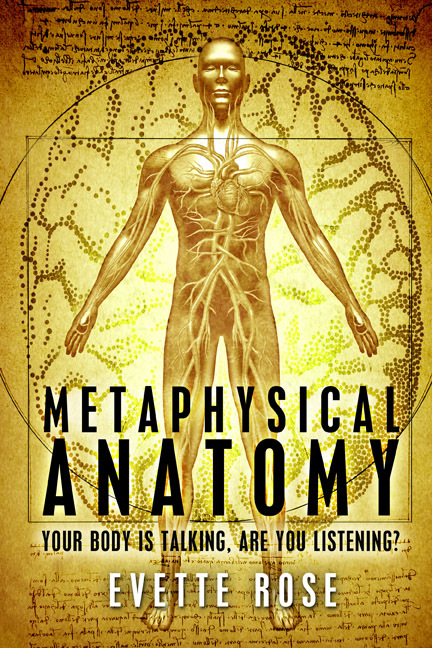 Metaphysical Anatomy is an invaluable reference that will support, guide and help those that have the willingness to change their lives and understand the language of their body. Metaphysical Anatomy will now be proof read and then will be available for sale thereafter. It will be on the shelves before you know it! In today’s article I share a brief history of RPT and how it has changed so much in 4 short years. I gave my own self-assessment of my performance (poor) and share my plans for 2012. I also answer your questions about re-certification and what has changed since you first learned RPT. RPT has changed so much since its inception in 2008 and launch in January 2009. In fact it has changed SO much that its name is meaningless. In 2008 I thought healing was all about finding the earliest “reference point.” Now I can teach all 3 levels of RPT without using that phrase. My last group email confused a few students about what version of RPT they learned, or were about to learn. I want to clear up any confusion by sharing a short history of RPT and its evolution through 4 versions. At the end I’ll be asking your opinion about whether to change the name. 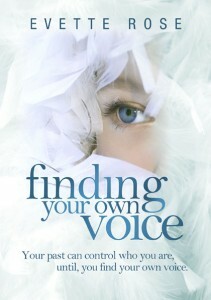 Finding Your Own Voice is available for sale now! This book is a must-read for people who have experienced abuse or care about someone else who may be stuck processing their childhood experiences. This book brings an empowering message of hope and self-healing to anyone who is stuck. Healing practitioners will learn powerful new approaches for helping their clients without them needing to relive or recount their painful memories. Finding Your Own Voice is unique in explaining the nature of abuse trauma and how to heal it. Evette shares her own difficult childhood experiences and explains how she was finally able to release the symptoms of the trauma through the techniques she shares in the book. Even those who have not experienced abuse will benefit from understanding the nature of trauma. Many therapists believe they know how to deal with abuse. However their mistakes (talking about the abuse, reliving past experiences, trying to change beliefs, etc.) indicate that they have much to learn. The evidence for this simple: many people’s symptoms of abuse do not resolve, even after years’ of therapy. Abuse trauma goes much, much further and deeper than what traditional counseling can process. In this book, Evette has taken this subject to a new level, not explored by most practitioners. Never feel alone again, thinking that your past is a deep dark secret. There are many people that have experienced abuse. The reason why we think these things only happen to us is because no one talks about it. I have decided to speak out and speak up. I use my childhood abuse as the foundation of my book. I explain how abuse can control your life and identity, and how it can suppress your gifts, qualities and personal power. As many readers can attest, simply reading this book is a profound healing journey. If you have suffered abuse, you will find hope, healing and new perspectives from this personal tale. If a friend or loved one is struggling to shake the memories of their past, this book will help them to find their own voice. This book will help people to understand the actions of abusive people and how to become aware that they themselves might be stuck in a never-ending abusive cycle. You can download the book’s Table of Contents here. Evette has now launched her own blog where she writes articles related to healing and understanding abuse and trauma. Visit it at www.EvetteRose.com. If you purchase the book before the end of April 2012 you will receive two powerful meditations (in mp3 format). In these healing meditations I will guide you through a simple and effective process for clearing physical and emotional pain and discomfort. Both meditation tracks (average 20 minutes each) help you to apply the books’ teachings in the quickest possible way so that you can get results immediately. As soon as you have bought the book you can download the meditations and you can be healing even before you book arrives in the post. To receive these meditation tracks, merely email your purchase receipt to meditations@evetterose.com and the free guided meditations will be emailed to you. Buy now, before this special healing offer expires. This entire package is only $33.33 this FREE offer ends end of April 2012! Dear friends, this blog post is an article that was published in the March 2012 edition of Into Light Magazine. I explain several of the key processes in our Level 2 course. This information has never been published on this blog (or anywhere) before. Enjoy! Healing techniques – all of them – could be thousands of times more effective if turned inside out. Corporate lawyer turned healing researcher and instructor, Simon Rose, explains how. How you were conceived – those vital first moments when mother met father and sperm met egg – carry a signature that can determine everything about your life, your health and ability to form stable relationships. Those vital moments, known as Key Developmental Events (KDEs), hold the key to a radical new approach to healing which is just beginning to turn the healing world upside down and inside out. In this article, I’ll show you just one of the ways in which this information turns the healing world upside down and inside out. You can use this information to achieve extraordinary results, whether in your own healing journey or to assist you as a practitioner. KDEs are not just one more piece of the puzzle, like one more thing on a very long list to clear. Instead, this information can potentially replace years and years of therapy, eliminating the concept of digging through your issues like layers of an onion. The concept of KDEs comes from amazing biological research in the fields of consciousness or enlightenment research [#1] and the science of epigenetics. I call this field “frontier psychology” and I guarantee that over the next 10 years it will turn every healing technique and hopefully mainstream psychotherapy upside down. It's horses for courses -or is it? Is it true that no one technique can work for everyone; that we need to “shop around” in order to find what works for us? I think that most healers believe this, not because it is true but because it is what we’ve been told. After all, shopping around is good for the economy right? Well yes, but it is not necessarily good for you or your wallet! Today I’m going to put forward the radical idea that you don’t have to shop around. If something “works” to fix problem X in someone else, then it should work for you too. And if it doesn’t, well it probably never really worked anyway. (See yesterday’s post for my definition of “works,” it may not be as simple as you think). If something “works” for a lot of people, it doesn’t mean that it has to work for me, too. … Even though I think there’s not “one thing” that works for all people and problems. I really believe that this is untrue. That if something truly works, it should be universal. In fact I think that’s what “works” should mean. Think about it like this – if a therapy works on one person in a hundred, and you are that one person, does that mean that it “worked” for you? No, it means that you were lucky and probably the placebo effect helped. If something works, it really works. Maybe not 100% but when it fails we should understand why. For example, antibiotics work. No one doubts that antibiotics kill bacteria. But what about when antibiotics don’t work? Unfortunately, some bacteria have grown resistant to antibiotics and have evolved resistance. So in this case we can still say antibiotics work, but we acknowledge that there’s a valid exception. Antibiotics still “work” but the target is getting stronger. Can we aim for 100%? Here’s the problem: Ninety-nice percept of healing is a placebo. Very few people can get their heads around this. I believe that if you can understand this statement you are more likely to be healed or be able to heal others. Of course healings “work” – if by that you mean that some people get better. Of course placebos work – it’s well known lots of people given the sugar pill will heal. But what does it mean to say that something really works?